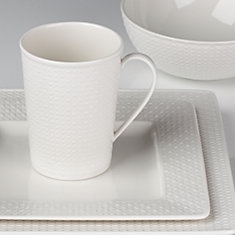 The Entertain 365 Surface Texture Square 4-piece Place Setting is perfect for entertaining and everyday. This 4-piece dinnerware set takes you from breakfast in bed to a gala evening. Capacity: bowl: 16 oz. ; mug: 12 oz.